Home→HOTELS→Cabinweb→Spend the Night in a Conestoga Wagon in Oklahoma City! 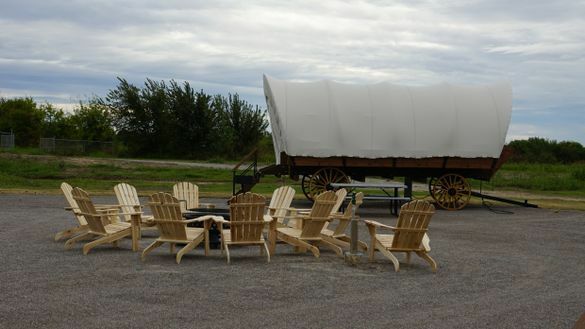 Guests at the Farm can choose between two unique Conestoga wagon experiences. For the campers who prefer modern amenities while camping (the glampers), two packages are available, each with a private bathroom and shower, deluxe mattresses with bedding, temperature-controls, picnic tables, a charcoal grill, and a central fire pit that is topped off with a complimentary s’mores packages. The first glamping package sleeps four people with a king-size bed, a bunk bed and a large table. The second package sleeps six people with a king sized bed and two bunk beds. For the solely nature adventurers, the camping-style package is perfect for large groups or family gatherings. Each of the eight wagons has eight beds with deluxe mattresses, guests will just need to bring their own bedding or sleeping bags. The packages are $195 plus tax per night. Additional campers have the option to pitch a nearby tent for $10 per camper.